Thank you to Identity Games for providing me with products to facilitate my blog review. All opinions are 100% my own. We love playing family board games. Now that my daughters are eight and ten years old, we are able to play even more games as a family. We try to set aside one night a month to sit down for a family game night. It is a lot of fun and something we look forward to. 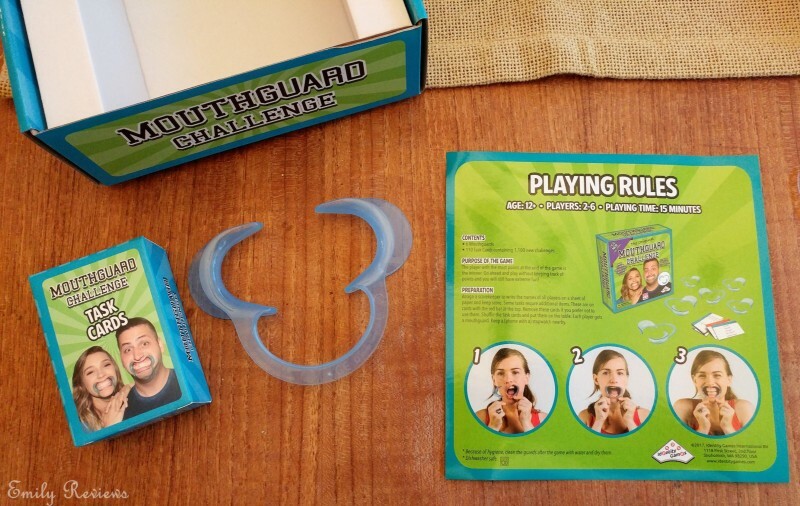 I was recently asked to try a new game from Identity Games, called Mouthguard Challenge Extreme. I thought this would be a fun new addition to our game cabinet. When playing Mouthguard Challenge Extreme, contestants choose a card and do or say what is listed on the card. Oh but wait, it isn’t that simple. They must say or do it while wearing a mouthguard! Other players get to guess what you are saying/doing. Mouthguard Challenge Extreme comes with 1,100 challenges and six flexible (and machine washable) mouthguards. Whichever contestant has the most points at the of 15 minutes, wins! 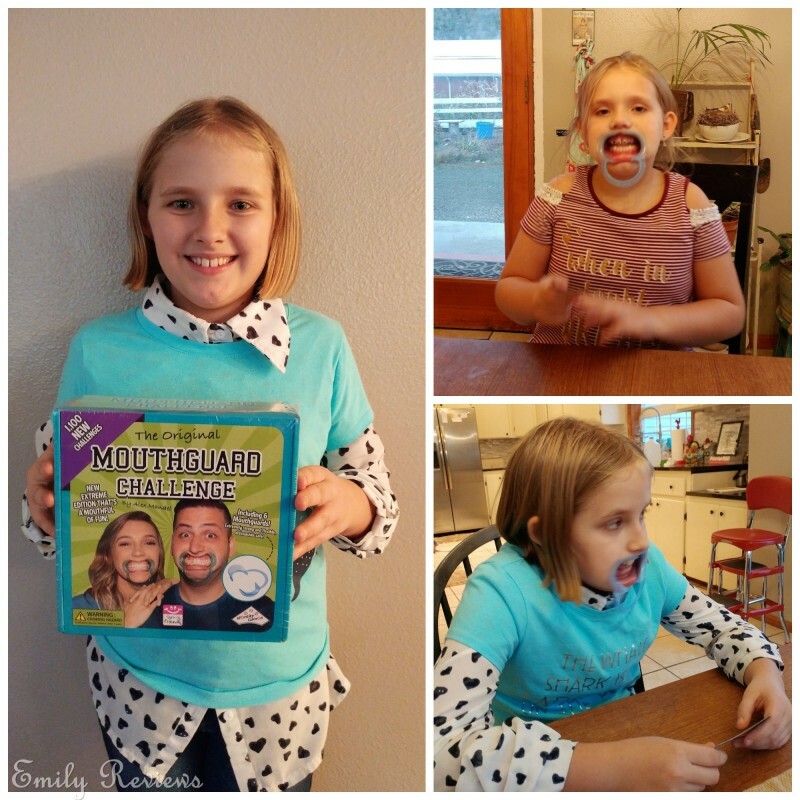 My daughters and I sat down to play Mouthguard Challenge Extreme last night. We had so much fun! I was surprised how well they were able to speak with mouthguards in their mouths. Lol. I struggled to say the simplest things like ‘buttered popcorn’. While they did fairly well completing tongue-twisters. The suggested age on Mouthguard Challenge Extreme is twelve years old. I am really not sure why it is so old. My eight year old had no problem playing the game and in fact, she had a lot of fun with it. I think Mouthguard Challenge Extreme would be a fun gift idea for tweens and teens this holiday season. Buy It: Please visit the Identity Games website to see the great selection of products they offer and convenient shopping locations. Connect: Don’t forget to follow Identity Games on Facebook, Twitter, and Instagram for the latest product announcements and special offers. WIN IT: One winner will receive a Mouthguard Challenge Extreme game. This is a US giveaway and it is scheduled to end on 11/15/2017. Good luck. im not seeing the contest? Hello, Molli. Sorry for the inconvenience. I was excited to get this posted and forgot the giveaway link. It is on here now. Hi, how do you enter the contest? Hello, Meghan. My apologies. I forgot to add the giveaway link. It is on here now and I added a couple extra days. This looks like fun. I wonder if there is a way to order extra mouth guards. Seems like you wouldn’t want to reuse them too often. Very strange game. I can see where teens would find it fun.